Football referees are more likely to hand out harsher penalties when replaying situations in slow motion, a new study has found. Cognitive scientists in Belgium researching VAR (video assistant referee) technology found that while replays did not significantly affect the accuracy of a decision on whether a foul had taken place or not, they did affect judgement on intention. 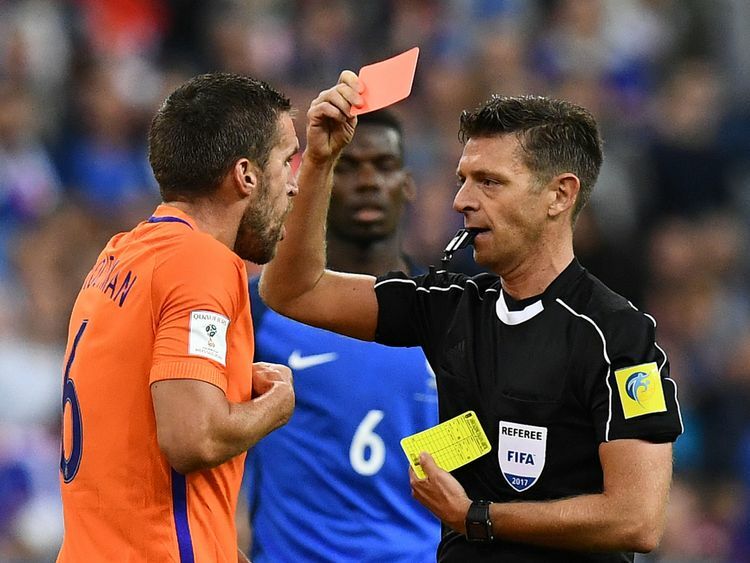 The study was conducted by Dr Jochim Spitz and colleagues at the University of Leuven on the response of 88 elite football referees to videos of yellow-card fouls. Referees were 63% accurate when using slow-motion replays to make a technical decision on whether or not a foul was committed, compared with 61% accurate in real time. However, 20% of the referees gave a red after watching the video in slow motion – compared with 10% when watching in real time. The results show that fouls viewed in slow motion “appear to be more serious,” the researchers said. Dr Spitz said: “Our results suggest that slow motion can increase the severity of a judgement of intention, making the difference between perceiving an action as careless (no card), reckless (yellow card) or with excessive force (red card). The study will bring into question VAR, which is being used for the first time at a World Cup during this year’s tournament. During the finals, officials with access to 33 different camera angles – four of which are filmed in ultra slow motion – will be able to replay key incidents. The VAR will be used to check on four kinds of incidents: red cards, mistaken identity, penalties and goals. Although the study’s authors say playing video back can be a useful tool for assessing decisions, it is not the best tool for decisions which require referees to judge human behaviour and intention. The research tested referees from five European countries by showing them 60 video clips of foul situations from football matches in either real time or slow motion. Two independent ex-international referees determined the correct decisions as a point of reference, with the testers then categorising the fouls as either red, yellow, or no card. PrevHow many animals are born in the world every day?